A blockchain for the Dairy industry? An example blockchain for the dairy industry. Different agents are responsible for adding new blocks in the chain at different moments within the process. Farmer using Connecterra’s Ida service, we can automatically add new blocks into the blockchain indicating how healthy your cows are. Furthermore, you could even decide what information you are willing to share with others, and what you are not. Afterwards, your milk meters or farm management software could give us the milk yield for those cows, generating a full profile of your cow within the blockchain. Up to this point, this is completely transparent to you. 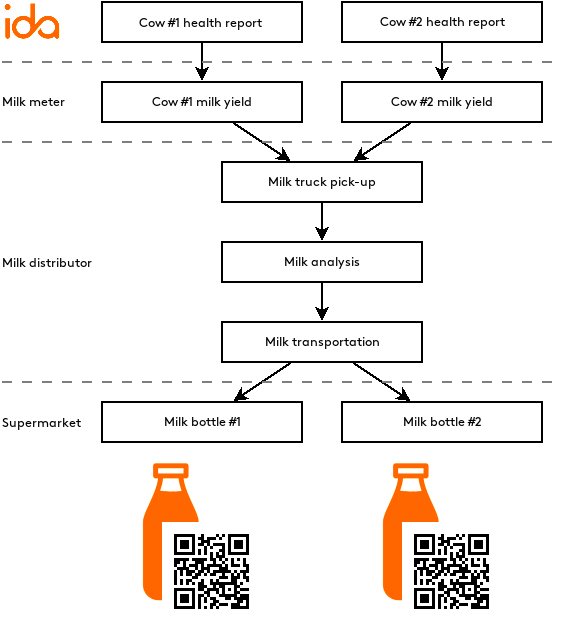 Once your milk is picked up by a truck, you can easily use an app to confirm the transaction between you and the distribution company: cryptographic technology will ensure that this is done in a way that can be easily validated by third parties.